With big lead generation quotas and demanding sales teams, marketers need to know which online events will get them the right quality and quantity of leads, how to get the audience's attention and how to turn that engagement into a long-term relationship with their brand. 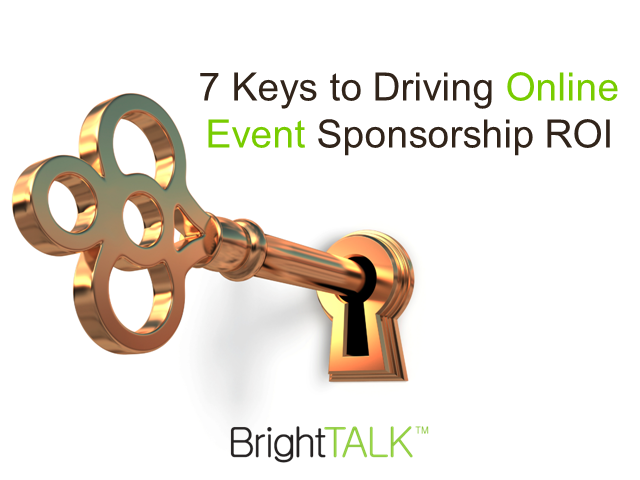 Attend this webinar to learn proven best practices for driving sponsorship ROI in the digital world. In this year’s annual Benchmarks Report, BrightTALK has analyzed a wealth of data, looking at over 100,000 webinars and videos, with 16,000 being created within the past year, millions of audience interactions, and for the first time ever direct insight from our more than 8 million users. Join this session to hear actionable findings and insights on marketing with webinars and videos. For the last 10+ years, we’ve been able to see first-hand how top-performing marketers use content and demand strategies for business growth. During this time, we shared their tips and tricks while also optimizing our own efforts for success. Starting with a modest marketing team and budget, we focused on continual improvement in how we use our own products and services to achieve growth. Now, with a centralized team of 8, we’ll share how we invested $600,000 last year to achieve $20M in pipeline and $8M in closed-won business from webinars and videos hosted on BrightTALK. Creating videos that make an impact and drive business growth is easier said than done. Most marketing teams are skilled to tell stories via webinars, social, articles, white papers, collateral and eBooks. Video-based storytelling requires expertise that is rarely available in-house. Join this talk to understand how to elevate your storytelling and brand with impactful video. With Cisco telling us that 80% of web traffic will be video by the end of this year, it's clear that our target audiences want to be inspired and engaged when they self-educate online. The challenge for B2B marketers is that creating live webinars and videos is considered resource-intensive and hard to scale. This is a point of frustration for marketers as these content formats consistently rank among the most effective demand generation tactics out there. Join this webcam panel with a publisher, digital marketer and product marketer to understand how to create more authentic connections with live content and how to acquire more leads that engage with your webinars and videos. After joining this Talk, you will have actionable insights on how to create webinars and videos at scale while driving more ideal audiences to your live and on-demand content. Plus, you'll get some benchmarks data on the conversion lifts you can expect in terms of pipeline contribution and conversions to bookings. Enjoy! With limited resources, Felicia and the team needed to ensure marketing efforts not only created brand exposure but also serve as a steady source of lead generation. For PubNub it was about engaging new buying groups outside of their current reach. Using BrightTALK Channels and BrightTALK Community Summits, PubNub has seen a jump in leads generated and quality is good too. 60% of leads are made up of Manager+ decision makers. Felicia considers BrightTALK's content and demand marketing platform a strategic part of her integrated marketing mix. BrightTALK customer Palo Alto Networks, represented by Stephanie Broyles, shares her experience of using BrightTALK's content and demand marketing platform. By combining BrightTALK Channels with BrightTALK webinar and video services, they have extended their team with storytelling experts and campaign conversions are growing. With BrightTALK Content Leads and BrightTALK Summits, Palo Alto is engaging new audiences and acquiring more customers. BrightTALK customer LogRhythm, represented by Christina Phillips, talks about using BrightTALK's content and demand marketing platform. Over two years, one third of LogRhythm's pipeline came from webinars and videos, so this has received a lot of executive attention. From an ROI perspective, BrightTALK continues to perform. BrightTALK Customer BNY Mellon, represented by Adam Koster, talks about using BrightTALK's content and demand marketing platform. With BrightTALK Channels, online events, video series and amplified audience reach, BNY Mellon have generated the most qualified leads for their Sales teams. The marketing automation connector is simple and makes campaign attribution easy. The introduction of GDPR in the EU last year took the marketing world by storm. Teams worked furiously to evaluate their data handling protocols and to construct new processes that are both effective and compliant. Yellowfin was seeking a demand generation solution to engage new audiences and acquire more customers. Yellowfin used a BrightTALK Channel to give inspiring Talks, BrightTALK Summits to generate awareness and quality leads. Over the past 12 months, BrightTALK contributed 45% of Yellowfin’s total inbound activity. This translated to 50% revenue growth. Yellowfin was seeking a lead generation solution, and had existing contacts to target and were seeking additional audiences. Yellowfin has been using BrightTALK Summits for brand awareness and growing their audience and increasing MQLs.Brighttalk has massively impacted the volume and engagement of Yellowfin’s inbound leads. These leads have a much greater conversion rate. In the past year, Brighttalk has contributed 45% of Yellowfin’s total inbound activity. There’s always more than one priority in B2B marketing. As marketers, we strive to get the balance right to guide our actions for developing a strong brand, shaping our narrative in the marketplace, and creating demand from our marketing channels. Increasingly, the digital behaviors of our ideal audience continue to fragment. No longer are they dedicated to a single device or source or input (voice vs text). This perpetual change has challenged decade old algorithms to better recognize their intentions. B2B marketers now face a new priority. How do we leverage Intent signals and prioritize the use in go-to-market efforts? Join David Pitta, CMO at BrightTALK who has been leveraging various signals of intent data to prioritize resources, channels, and demand creation over the last 10 years. Sales is great at speaking with prospects, uncovering their particular needs and pain points, and making adjustments on the fly based on what is resonating and what isn’t during a conversation. However, your website, marketing collateral and revenue marketing campaigns can’t make these same real-time adjustments based on body language, questions and other customer feedback—whatever potential customers see is what they get. As the B2B landscape shifts and buyers do an increasing amount of research on their own, it’s more important than ever for tech execs to prioritize strong B2B messaging so they clearly articulate the value prop and compel prospects to engage. In this presentation, Christa Tuttle, CEO of Launch Marketing will guide participants through strategic approaches and best practices for building company messaging that gets right to the heart of what customers need and triggers revenue-generating actions. Your marketing team is focused on efficiently delivering results, however as the buyer’s journey (if it can still be called that) becomes less linear and more complex, you’re facing ever-increasing stress on resources. To effectively reach and convert targets at scale, new perspectives and methodologies are crucial for balancing these competing needs. In this live webinar, BrightTALK’s CMO David Pitta and Content Manager Trent Warrick will share how to maximize efficacy with authenticity, while scaling using intent data, and reserving your team’s resources for high-value activities. Kim Hahn sat down with us to share CA Technologies' experience with our platform at BrightTALK Local: NYC. Ensuring alignment across such a big organization like CA Technologies has been key to maintaining a consistent story that resonates with their audience, and manageable for their teams. Find out how BrightTALK has become the platform they look to for their content and demand marketing program to drive engagement and conversions. Discover what's trending in the IT Security community on BrightTALK and how you can leverage these insights to drive growth for your company. Learn which topics and technologies are currently top of mind for security professionals and decision makers. Tune in with Dave Klein, Senior Director of Engineering & Architecture at GuardiCore and Marija Atanasova, Senior Content Manager for IT Security at BrightTALK, to discover the latest trends in the community, the reasons behind them and what to look out for in Q4 2018 and beyond. With the rise of mobile and social, customers are more knowledgeable and empowered than ever. Their ability to access and share information anytime and anywhere gives them enormous control over their interactions with the companies they do business with—and they know it. As a result, they expect data-driven, personalized interactions at every stage of the marketing and sales funnel. One way marketers can adjust for the new normal is by leveraging big data and analytics—along with artificial intelligence, mixed reality and machine learning. Join CMO, Scott Holden, in a live webinar to learn how his team has mastered marketing attribution with ThoughtSpot’s search-driven analytics. Using ThoughtSpot, Scott’s entire marketing team can now analyze all their marketing data in one place without waiting weeks. Attribution is no easy thing for today's marketeer. Everyone in the business is asking "what's the repeatable sales cycle and number of touches our buyer takes to get a deal over the line". Finance puts pressure on teams to report in near real-time what's working and what's not and without answers budgets are held up. Sales teams need to personalize outbound efforts so they can efficiently engage the buyer but marketing needs to guide what content and what channels work best. Navigating the maze of attribution is both a qualitative and quantitative undertaking and unless you have the tech stack fully integrated, you may be missing key pieces of the puzzle. As daunting as it can be there is a step by step approach to follow and over time you achieve clarity. Join this webcast to learn best practice approaches to becoming a fully attributed marketing engine. When you think of your customers as a jumble of demographics and lead scores, it's easy to miss the critical intent indicators that help you understand their pain points and needs on a deeper, more human level. For those of you who have started using intent signals to prioritize accounts or leads, you're likely challenged by the fact that anonymzed data without any context around where the engagement happened and for how long, makes it hard to turn intent signal into business growth. Discover the behavioral indicators that signal real intent for identifying and converting your ideal accounts and buyers. Learn how to use them to boost content and demand marketing success. Truly defining your audience. We'll look beyond cookie-cutter personas and help you get into the mindset of your buying committee. Tapping into the intent signals that really matter via proprietary, first-party data and key sources that give you the full picture. Putting it all together. Turn intent into engagement in a few steps. The BrightTALK Academy features the fundamentals of executing webinars and best practices to develop channel owners into advanced hosts.